Calcareous materials, like marble used in connection with cultural heritage objects such as statues and pedestals, or as wall facings on buildings, often show a brownish staining owing to contact with iron metal or iron-containing minerals in the stone. The discolouration alters the appearance of the stone, which is undesirable from an aesthetic point of view. Despite rust staining being a conspicuous phenomenon and numerous works that have dealt with the problem of removing rust stains, a simple and non-toxic method has so far been missing. This paper describes a highly efficient method for cleaning rust stains from marble by introducing the chelating amino acid cysteine in a Laponite poultice in combination with the strong reducing agent sodium dithionite. Cleaning experiments were performed on artificially discoloured samples of various types of Carrara Bianco marble and on naturally rust stained marble. To begin with, solutions of cysteine in combination with sodium dithionite and ammonium carbonate were tested by immersion of samples into the different solutions. Secondly, solutions of cysteine and sodium dithionite with and without buffering were used in a poultice consisting of Laponite® RD, Arbocel® BC1000 and CMC. The poultice was applied on three different marble types: Carrara Fabricotti, Carrara Vagli and Carrara La Piana. Thirdly, the optimized method was tested on original rust stained material of Greenlandic marble, which has been used as wall facing, and finally in situ in Copenhagen on a larger area of The Marble Church showing rust stains due to pyrite oxidation. The cleaning results were evaluated by visual observations, cross sections, and etching of the surface by testing on high gloss marble. Cleaning of iron-discoloured marble surfaces has been investigated and a new method for removal of rust stained marble has been developed. A solution of 0.1 M cysteine and 0.1 M sodium dithionite in a poultice consisting of Laponite® RD/Arbocel® BC1000/CMC = 10:10:1 has shown to be a fast, simple, cheap, and non-toxic, do-it-yourself method. Since ancient times, white marble has been used as a popular material for sculptural artefacts such as statues, busts, and friezes as well as an architectural building material with numerous applications from flooring, wall facings, and pedestals, to columns and fountains. Although marble is a relatively stable material, the desired white surface is unfortunately prone to tarnishing when used in outdoor environments . One of the major sources of tarnishing is iron. In addition to the oxidation of internal iron compounds present in stone like pyrite (FeS2) and siderite (FeCO3) [1, 2], contact with iron-rich ground water when marble is used in, for example, garden fountains, results in severe and unsightly discolouration . Another cause is the proximity to iron metal, which is oxidized by air in the presence of rain. The solubilized ions are then transported by rain onto the marble surface, resulting in rust formation . The detailed mechanism for rust formation is highly complex; depending on the pH value, different species, all characterized by a brownish colour, are formed. The atmospheric corrosion of iron, regardless of the pH value of the reaction may, however, be summarized by the overall stoichiometric reaction (1) where the product FeOOH represents the generic formula for rust . The general name rust consists of a variety of iron(III) oxyhydroxides or hydrated oxides of high stability and low solubility. The actual species formed depend as mentioned on the pH value and the presence of different anions [6–8]. The thermodynamic parameters and solubility products have been estimated for many of the rust species, such as ferrihydrite and α-, β- and γ-FeOOH (goethite, akaganeite and lepidocrocite). These investigations have shown that goethite defines a thermodynamic minimum of the rust system [7, 9] and the solubility product of goethite (Ksp = 10−41) is the lowest among the different rust species . This means, from a thermodynamic point of view, that rust can be examined as goethite, and thus the cleaning of rust can be considered as removal of goethite. Rust discolouration of marble is characterized by areas or stains having an orange to brownish colour, which alters the appearance of the stone. From an aesthetic point of view, the discolouration is undesirable and stone conservators and conservation scientists have therefore worked for several decades with various cleaning methods in attempts to remove rust stains from marble and calcareous stone materials [3, 10–12]. Due to the nature of the discoloration and the possibility of damaging the stone, the stain can only be removed by chemical cleaning. The current method for rust cleaning involves application of different ligands and reducing agents mixed in a poultice and placed onto the stone surface. One of the ligands most widely used is the citrate ion [10, 11, 13], though salts of other carboxylic acids, such as oxalic and tartaric acid, have also been used . Other methods involve the use of fluoride  or EDTA . A relatively new method is the use of the hexadentate ligand tpen, which, in contrast to EDTA, has a high affinity towards iron and a low affinity towards calcium . This ligand has shown excellent results when tested on a discoloured marble fountain, however this method is rather expensive. The ligands are used either alone or in combination with reducing agents like thiosulfate, dithionite or polythiophene [3, 10]. Thioglycolic acid and ammonium thioglycolate have been applied in several conservation treatments of calcareous stone . Thioglycolate is presumably the most efficient ligand for cleaning rust stained marble [12, 13]. However, thioglycolic acid is a toxic chemical, and is thus difficult to acquire for private stone conservators without access to a laboratory. In addition to this, a slightly violet colour may appear on the marble when cleaning with thioglycolic acid, which demands a second cleaning . In this study, we have aimed to investigate and develop a new method for rust cleaning of discoloured marble. The focus has been on the use of cheap and commercially available chemicals. Another target was reduction of Fe(III) to Fe(II) while cleaning. Efficient removal of a slightly soluble material requires a ligand having an overall stability constant comparable to the reciprocal value of the solubility product in order to achieve a favourable equilibrium constant. Based on the solubility product of goethite, efficient removal of rust in Fe(III) stage requires a ligand having a stability constant approaching 1041, whereas removal of Fe(OH)2 only requires a stability constant of 1014. Additionally, the ligand should possess low affinity towards Ca(II) to prevent dissolution of calcite. In the search for an efficient method for rust cleaning, the focus has been both on a ligand showing strong complex formation with iron and weak binding to the major constituent ions in marble i.e. Ca(II) and Mg(II), as well as on the identification of a fast reducing agent able to reduce Fe(III) to Fe(II). Among the reducing chemicals, sodium dithionite (SD), Na2S2O4, has been successfully used in combination with different ligands as a dissolving agent for goethite in soil analyses [14, 15] and for removal of rust from paper . Furthermore, the use of dithionite in conservation science in general is well described . The standard reduction potential, e°, of dithionite in the basic solution given in Eq. (2) has been determined to −1.12 V (vs. NHE) [15, 17] and is thereby one of the strongest reducing agents among the simple, cheap, commercial reagents. The reducing power decreases with lower pH values and using pKa2 = 7 for hydrogen sulphite the potential can be calculated to e°′ = −0.29 V at pH = 7. In aqueous solution dithionite partly dissociates, forming the highly reactive monomeric sulphur dioxide radical anion with the dissociation equilibrium constant K = 10−9 . Even though the amount of the radical anion is relatively small and can be estimated to 10−5 M in a 0.1 M dithionite solution, the anion has shown to be the dominant reducing species in the reduction and dissolution of iron oxides [14, 15]. From biochemical experiments, the standard reduction potential of the radical anion has been determined to −1.39 V (vs. NHE) in basic solution [18, 19], giving a calculated value e°′ = −0.56 V at pH = 7 in accordance with experimentally determined values . The reduction potential for reduction and dissolution of synthetic goethite has been calculated to e°′ = −0.14 V (vs. NHE) at pH = 7 . Using this value and either dithionite or the sulfur dioxide radical anion in the reduction and dissolution of goethite to Fe(II), the reactions can be written as in Eqs. (5), (6) with the electrochemical potentials of E°′ = +0.15 V or E°′ = +0.42 V.
Both reactions are spontaneous processes with relatively large equilibrium constants, which can be calculated to K = 105 or K = 107, respectively. From a thermodynamic point of view, dissolution of rust could be achieved by SD solutions only. However, the presence of a ligand for removal of the Fe(II) ions is preferable in order to avoid re-precipitation caused by oxidation from oxygen. In search of a ligand useful for rust removal, a sulphide-containing species similar to thioglycolate were examined. The amino acid cysteine (cys), commonly found in natural proteins as the L-isomer, is commercially available and affordable. Cysteine forms complexes with Fe(III) and Fe(II) with high stability constants and only very weak complexes with Ca(II) and Mg(II) . At the same time cysteine reacts as a reducing agent in the iron(III)-cysteine complexes with formation of colourless Fe(II)-cysteine complexes . The intense violet colour known for Fe(III) complexes with ligands containing thiol groups like cys and thioglycolate [12, 22] may therefore be avoided. In addition to this, cys is also able to perform reductive dissolution of iron(III) oxyhydroxides, thereby independently having a solubilizing effect of rust . Table 1 shows the stability constants of the marble constituents Ca(II), Mg(II), Fe(II) and Fe(III), with the commonly used ligands for rust cleaning i.e. citrate , oxalate , tartrate , edta , tpen [26, 27] and thioglycolate [24, 28], together with cys [21, 28]. The solubility products of CaCO3 , MgCO3 , Fe(OH)2 , and FeOOH  are also given. As seen from the constants, only edta shows affinity towards Mg(II) and Ca(II) in an order resulting in serious dissolution of MgCO3 and CaCO3, whereas the remaining ligands display relatively weak binding constants, causing little dissolution of marble itself. The stability constants of cys are similar to the values of thioglycolate, and cys possess very high affinity towards iron(III), which is even higher than for edta. Towards iron(II) the overall stability constant is of an order of magnitude close to the value for tpen, thus making cys an ideal candidate for cleaning of rust stained marble. Reduction of Fe(III) to Fe(II) by cys is accomplished by oxidation to cystine, which is insoluble in water, causing unwanted precipitation. However, the presence of SD together with cys prevents precipitation of cystine due to the ability of dithionite to re-reduce cystine formed. The reduction potential of cys is estimated to approximately e′ = −0.25 V at pH = 7  which is higher than the potential of dithionite. In Fig. 1, the reduction reaction from cystine to cys (zwitterion form) is shown together with the acid dissociation of the thiol group, forming a cysteinate species. This anion may react as a bidentate ligand towards metal ions via the sulphur and oxygen donor atoms , but other coordination involving O, N and O, N, S donor atoms are also possible. The iron-cysteinate complexes are complicated and not straightforward due to redox reactions similar to those observed for the iron-thioglycolate system [22, 28, 30–32]. The pKa values of three functional groups i.e. carboxylic, thiol and protonated amino group are 1.88, 8.15 and 10.29, respectively . Using the values of the first two pKa constants, pH in solution of the cys zwitterion can be estimated to pH 5. In general this pH value is too low for cleaning marble, due to acid dissolution of CaCO3 [12, 13]. The pH value can be adjusted by the addition of a base such as ammonia (NH3) or ammonia carbonate ((NH4)2CO3), and in some cases when the cleaning mixture is used in a poultice, the poultice itself can act as a buffering agent. Laponite, for example, releases OH− below its point of zero charge, which is obtained around pH = 11 and an aqueous suspension of Laponite is alkaline  (measurement shows pH = 9.3). Since the dissolution of goethite consumes H+ (Eqs. 5 and 6), the pH is also raised during the reaction. Considering that the oxidation of iron(II) and cys is eased with increasing pH favouring precipitation of both iron(III) oxyhydroxides and cystine, a reaction value around pH = 7 may be preferred, although pH = 9−10 is desired with respect to the solubility of calcite [3, 12]. The chemicals used for cleaning of stained marble are commonly applied in a poultice and a wide range of poultice material has been tested and applied in stone conservation. Clay materials, such as bentonite, attapulgite and sepiolite, are widely used either alone or in combination with cellulose fibres [4, 10, 34]. Other methods use cellulose fibres alone [35, 36], MC (methyl cellulose) , CMC (carboxymethyl cellulose) , cotton pads [10, 38], and gels like glycerine , agar , agarose , or xanthan gum . One of the newer materials used for poultices is the synthetic magnesium silicate clay Laponite® RD [41–44]. When dispersed in water, Laponite produces a colourless thixotropic gel that is easy to apply on specific areas and on vertical surfaces. The high purity of Laponite and thereby the absence of natural iron impurities means that discolouration of the marble surface from the poultices itself is avoided. In this study, Laponite® RD is mixed with cellulose fibres (Arbocel® BC1000) with dimensions of 700 × 20 μm (lenght and thickness) in order to increase the porosity, the absorbing properties and the water retention of the poultice. In addition to this, a small amount of sodium CMC (carboxymethyl cellulose, sodium salt) was also added. This resulted in better mechanical properties, increasing both the adherence and the cohesion of the poultice, making it easy to apply and remove in large pieces without crumbling. Another advantage of this poultice composition was its shrinkage properties: when drying it shrank practically only in the direction of thickness, leaving the area dimension intact. Hence a uniform cleaning from the centre to the edge of the poultice was obtained. Three different types of white Carrara marble (Carrara Bianco): Carrara Fabricotti, Carrara Vagli and Carrara La Piana from the Carrara quarry in Italy were received. Prior to the study and the artificial discolouration, the marble samples were characterised by the European Standards for water absorption, DS/EN 13755:2008 and water absorption coefficient by capillarity, DS/EN 1925:1999. Original samples of naturally rust stained Greenlandic marble from 1937 were retrieved from the government building of The Public Guardian in Copenhagen, Denmark in connection with restoration of the building. The marble plates were used as wall facing and, when dismounted, a heavy iron discolouration was present on the backside of the plates. A high gloss polished marble of the type Carrara Bianco, Lorano was used for etching experiments. Carrara samples with a size of 40 × 10 cm and thicknesses of 2–4 cm were discoloured by immersing the samples in a 10 % w/w FeCl2 solution for 1 month. The samples were then dried at ambient temperature, cut into pieces of 10 × 4 cm, and finally dried in an oven at 60 °C for 4 days. For cleaning in solution, pieces were further cut into smaller parts at 4 × 2 cm. Cross sections were prepared by embedding samples in epoxy resin, cutting the samples to a thickness of 1 cm, followed by grinding. Cross sections were analyzed by Zeiss Axioplan 2 polarisation microscope. pH values were measured with a Radiometer PHM240 pH/ionmeter calibrated at pH = 7 and pH = 10. All experiments were performed at ambient temperature and RH. In order to investigate and optimize the chemical composition of the cleaning agents alone, samples of the discoloured coarse porosity marble La Piana were immersed in 100 mL of four different solutions all being 0.1 M of each chemicals: 1 cys, 2 cys + SD, 3 cys + (NH4)2CO3, and 4 cys + SD + (NH4)2CO3, respectively. All solutions were contained in crystallization beakers and placed on magnetic stirrers, which were stirred slowly for 24 h at ambient temperature. After 24 h the samples were retrieved, rinsed with water and dried. Based on the results from the solution experiments, iron removal was investigated with the cleaning agents mixed in poultices. In these experiments samples of the three different Carrara marble types and of the naturally rust stained Greenlandic marble were used. The ratio of the poultice materials was Laponite® RD/Arbocel® BC1000/CMC/H2O = 10:10:1:86. For cleaning of an area of ca. 10 cm2, the following recipe was used: 0.52 g of l-cysteine (4.29 mmol) was dissolved in 43 mL of tap water by stirring and after complete dissolution 0.75 g of Na2S2O4 (4.31 mmol) was added. The solution was then added with stirring to a 250 mL beaker containing a blend of 5 g Laponite, 5 g Arbocel and 0.5 g CMC. For the poultice containing ammonium carbonate, an additional 0.41 g (4.27 mmol) of (NH4)2CO3 was added to the cys + SD solution. The poultice containing ammonia used a 0.2 M NH3 solution instead of water. The pH value of the mixed poultices was measured to be pH 6.8 for cys + SD, pH 7.8 for cys + SD + (NH4)2CO3, and pH 10.1 for cys + SD + NH3. The poultice was applied in a layer of 1−1.5 cm thickness, covered with polyethylene food wrap, and left for 24 h. The plastic film was then removed and the sample was left overnight to dry the poultice. The poultice was then removed, the sample rinsed with water and dried in air. The optimized method was finally applied in situ on a larger area (74 × 58 cm) of The Marble Church in Copenhagen, Denmark. The lower part of the church is built in Norwegian Gjellebekk marble, which has unstable forms of pyrite and shows rust stains due to pyrite oxidation. The poultice containing 0.1 M cys + 0.1 M SD was applied on the church in a thickness of approximately 0.5 cm, covered with plastic and left overnight. The plastic was then removed and the poultice allowed to dry for additional 24 h before removal, where after the surface was finally washed with water. In Table 2 the result from the porosity measurements, water absorption, and water absorption coefficient by capillarity is seen. This classifies the porosity of the Carrara marble types as fine, medium and coarse, which is Fabricotti, Vagli and La Piana, respectively. Microscopy of discoloured Carrara samples shows the discolouration as small orange crystals in grain boundaries in homogenously distributed between the calcite crystals in the entire sample. Higher concentrations are observed in internal cracks and bigger pores in the stone. In the Greenlandic marble the discolouration is only detected on the surface of the sample. The presence of pyrite was confirmed in all the samples of Carrara marble as black cubic isotropic minerals. In the artificially discoloured samples, the formation of akaganeite, β-FeOOH, could be argued, as this crystal form is the one formed in the presence of chloride ions , whereas goethite, being the most stable rust species, is likely found in the naturally discoloured samples . Further identification of the iron compounds was not possible by microscopy due to the very small crystal size of the rust particles. The visual result from the cleaning experiments with solution 1, 2, 3 and 4 is shown in Fig. 2 as a, b, c, and d, respectively. A section of the artificially discoloured marble piece before cutting into smaller samples is shown at the top of Fig. 2. As seen in Fig. 2b, d, the samples from solution 2 and 4 containing both cys and SD are visually most cleaned. The cleaning effect in solution 2 and 4 was observed already after 1 h, and at that time no effect was observed in solution 1 and 3. In solution 1 and 3, a white precipitate identified as cystine by ATR-FTIR and XRD (see Additional files 1, 2, 3) was observed after 3 and 1.5 h, respectively. Leaving the solution 2 and 4 exposed to air after retrieving the sample, cystine precipitation was seen after 48 and 24 h, respectively. These observations indicate the importance of dithionite with respect to both the kinetically reduction and dissolution of rust as well as the prevention of the cysteine oxidation. The faster precipitation in solution 1 and 3, also shows the acceleration of cys oxidation in basic solution. Along with the cystine precipitation, the colour of the solutions turned bluish, indicating oxidation of Fe(II) to Fe(III) and the formation of Fe(III)-cys complexes [22, 28]. (NH4)2CO3 was used as a buffer agent to obtain an alkaline pH value in order to investigate any difference in etching of the marble surface. Using pKa = 9.25 for the ammonium ion and pKa2 = 8.18 for the cysteine thiol group, pH can be estimated to pH = ½ (8.18 + 9.25) = 8.7 in solutions 3 and 4, whereas pH in solutions 1 and 2 is estimated to pH 5 for the zwitterion of cys. However, based on visual observation of the roughness, the samples in Fig. 2 did not show any difference concerning etching of the surface with respect to presence of the buffer. Therefore, this issue was further investigated in the poultice cleaning experiments as well as in an experiment on high gloss polished marble. Based on the solution results, cleaning experiments were performed with poultices containing a mixture of either cys + SD alone or with addition of a buffer of (NH4)2CO3 or of NH3. The poultices were applied on all three types of Carrara marble, and the visual results of the experiments with cys + SD and cys + SD + (NH4)2CO3 are shown in Fig. 3. The three types of marble: Fabricotti (a), Vagli (b) and La Piana (c), are shown from left to right. The top section of each sample is cleaned with the poultice containing (NH4)2CO3, whereas the bottom is cleaned with the poultice bearing cys + SD only. The middle section shows the discolouration before cleaning. As seen in Fig. 3, a difference in the cleaning effectiveness, depending on the marble type, can be observed. The difference reflects the water absorption and the capillarity of the marble as well as the coarse porosity type. La Piana is visually the most efficiently cleaned sample. This result is confirmed by cross sections of the three cleaned samples (Fig. 4). A difference in effectiveness owing to the presence of (NH4)2CO3 can also observed in the individual samples. These sections are less cleaned compared to the sections without (NH4)2CO3. In addition to the lower cleaning effect, the poultice containing (NH4)2CO3 also showed changes in its mechanical behaviour and, upon removal, the poultice was crumbling. The result using NH3 as buffer (not shown) is similar to (NH4)2CO3. The samples are less cleaned, however, the poultice did not show tendency of crumbling. This result may indicate an increased oxidation of cys to cystine in basic solution, hence lowering the amount of cys able to react with iron(II). This result could also imply that the crumbling of the poultice arises from the salt concentration of (NH4)2CO3 rather than the basicity. 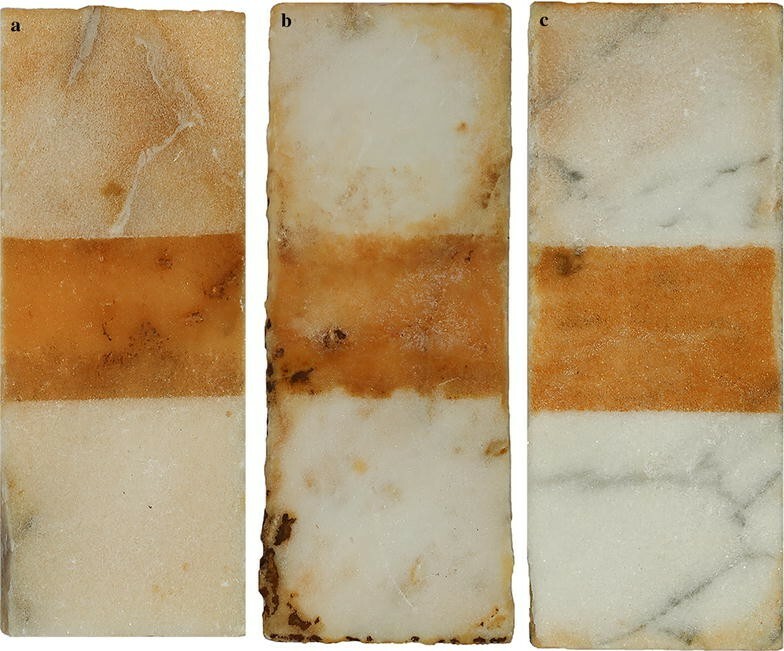 Figure 4 shows the photographs of parts of the cross sections of the marble types Fabricotti (a), Vagli (b) and La Piana (c) cleaned with the poultice containing cys + SD only. As seen in Fig. 4, the difference in the cleaning effect reflects the porosity of the sample. All samples are cleaned on the surface. Fabricotti and Vagli shows no discolouration in the top 0.4 mm, whereas La Piana is cleaned at twice the depth, showing no discolouration in the top 0.8 mm. As also seen in Fig. 4, no poultice material is observed on the surface of the samples, indicating the coherence of the poultice and its ease of removal after cleaning. By comparing the backside of the samples with the treated surfaces, no further etching of the surface could be detected apart from the etching already introduced by the artificial discolouration. 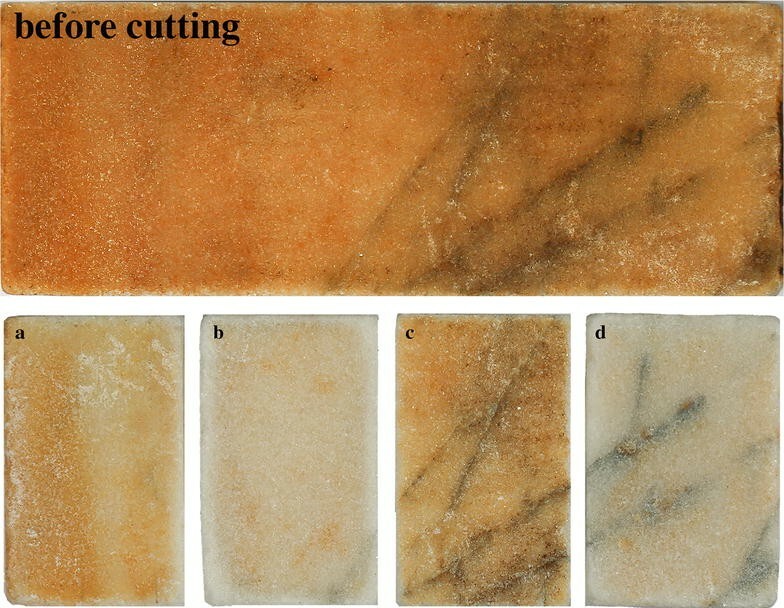 Figure 5 shows the cleaning experiment of a sample of naturally stained Greenlandic marble with the poultice containing cys and SD only. After one treatment, the surface was cleaned satisfactorily. The right part of the photograph shows the poultice material after cleaning and the yellowing of the poultice material reflects the absorbed iron. Figure 6 shows the in situ experiment on The Marble Church in Copenhagen. The rust stained area due to pyrite oxidation before cleaning is seen in Fig. 6a, the area covered with the poultice in Fig. 6b, and the area after cleaning in Fig. 6c. The rust layer was removed after one treatment, leaving a cleaned surface without rust stains. The blackish shades still observed after cleaning are likely to be pyrite or other impurities still present in the underlying pores in the stone. To further investigate any etching of the marble by the chemical cleaning formulations and the poultice itself, mixtures with cys + SD alone, with the additional buffers (NH4)2CO3 and NH3, and the poultice prepared with water only, were applied on high gloss polished marble of the type Carrara Bianco, Lorano. The result shows, based on visual observation of roughness, that a slight etching had occurred with the chemical cleaning formulation while no etching was observed with the poultice alone. The etching with cys + SD alone was slightly worse compared to the formulations with (NH4)2CO3 and NH3, whereas with NH3 the etching was almost invisible. This indicates the pH effect on the marble stone and that cys + SD does show a weak complexation and solubilization of the marble. However, the etching was only in the order of few micrometres and was only visually observable on high gloss polished marble. Based on these results, the use of the cysteine—dithionite formulation should be avoided on high polished marble. However, for marble used in outdoor environments already having a naturally weathered surface, the consequence and importance of this slight etching is debatable. Cleaning of rust stained marble by the use of cys and SD as cleaning agents in a Laponite® RD poultice has been investigated. The cleaning system was developed on artificially discoloured samples of Carrara marble and tested on samples of naturally rust stained Greenlandic marble and in situ on a larger area on The Marble Church in Copenhagen, Denmark. The Laponite was mixed with cellulose fibres with dimensions of 700 × 20 μm (Arbocel® BC1000) in order to increase the porosity, the absorbing properties and the water retention of the poultice. A small amount of sodium CMC was added to optimize the rheological and mechanical properties. The poultice adhered well to marble and its cohesion strength made it possible to remove in large pieces without crumbling and no residual poultice was left on the marble. When drying, the poultice only shrank in the direction of thickness, giving a uniform cleaning of the covered area. The use of SD gives a kinetically fast reduction of FeOOH to iron(II), which forms strong coordination complexes with cys. The complexes are absorbed into the poultice material and a cleaned marble surface is obtained in a short time. A slight etching in order of few micrometres of the surface can be observed on high gloss polished marble. However, the consequence and pragmatic importance of this can be discussed when cleaning marble showing wear and tear such as wall facings, pedestals, fountains or staircases. The cleaning procedure developed is a simple do-it-yourself method. The shelf life of the mixed poultice is approximately 2−4 h depending on the temperature. However, a relatively short shelf life is expected when strong reducing agents able to reduce rust are used. This means that a larger amount of premixed poultice can be prepared in the laboratory or studio and brought to the worksite, or the poultice can be mixed on-site needing only water and the solid compounds. The ratio of the poultice materials is Laponite® RD/Arbocel® BC1000/CMC/H2O = 10:10:1:86 and the concentrations of both cys and SD is 0.1 M. For cleaning an area of ca. 100 cm2 the following recipe can be used: 5.2 g of l-cysteine (43 mmol) is dissolved in 430 mL of tap water by stirring and after complete dissolution 7.5 g of Na2S2O4 (43 mmol) is added. The solution is added with stirring to a 2 L beaker containing a blend of 50 g Laponite, 50 g Arbocel and 5 g CMC. Before applying the poultice, the area is cleaned by wet-brushing in order to remove soluble deposits and salts. This wetting also gives a better adherence of the poultice. The wet poultice is applied on the marble surface in a layer being 1–1.5 cm in thickness, covered with polyethylene food wrap, and left for 24 h. The plastic film is removed and the poultice is left overnight for drying and then removed and disposed in accordance with national regulation. The marble surface is finally rinsed with water. All authors contributed to data interpretation and to finalizing the manuscript. All authors have read and approved the final manuscript. 40494_2016_81_MOESM1_ESM.tif Additional file 1: Fig S1. ATR-FTIR spectrum of the white precipitate. The ATR-FTIR spectrum of the white precipitate identifies it as cystine. 40494_2016_81_MOESM2_ESM.tif Additional file 2: Fig S2. XRD pattern of the white precipiate and of cystine. The white precipitate is identified as cystine by comparison of their XRD patterns. 40494_2016_81_MOESM3_ESM.doc Additional file 3. Supplementary material for: Effective cleaning of rust stained marble.